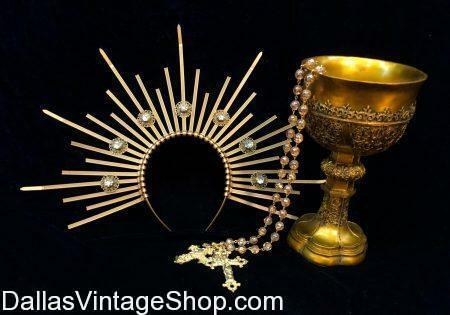 Just look at this Biblical Halo Crown from Dallas Vintage Shop. This Iconic Religious Halo is just like the Met Gala Heavenly Bodies Crowns and Headdresses the Celebrities wore on the Red Carped for the 2018 Met Gala Catholic Church Historical Liturgical Costumes and Gala Attire. There are several versions of of these Renaissance Era Auras, Halos, Crowns and Headpieces for Saints, Bible Characters and Historical Clergy. Dallas Vintage Shop has many styles of Heavenly Bodies 2018 Met Gala Halos, Crowns & Headdresses for Red Carpet Celebrity Outfits, Hollywood Red Carpet Celebrity Attire, Biblical Pageant Costumes, Church Historical Saints and Clergy Iconic Costumes and for film and portrait Artist Projects. Our Gold & Silver Biblical Halo Crowns, Metallic Gold Halo Headpieces, Diamond & Rhinestone Met Gala Headdresses, Elaborate Heavenly Bodies Red Carpet Celebrity Crowns, Met Gala 2018 Celebrity Costumes & Halos, Heavenly Bodies Iconic Catholic Saint Halo Headdresses, Decorated Halo Crowns, Bible Character Halos, Church Icons Headdresses & Halos are in stock in our Dallas Area Costume Shop. Get Complete Biblical Characters Costumes, Met Gala Celeb Recreation Outfits & Hollywood Red Carpet Theme Party Attire. This entry is filed under Biblical. You can follow any responses to this entry through the RSS 2.0 feed. Both comments and pings are currently closed.